Casey and I just wanted to extend a big thank you to everyone involved with helping us get this house! We absolutely love it and were really blown away at how hard everyone worked to get us to close so quickly. Thank you!!! A Reverse Mortgage is a retirement tool that allows senior homeowners 62 or older to convert home equity into TAX-FREE CASH. 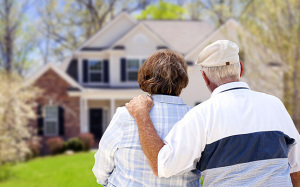 A reverse mortgage can also be used to purchase a home while not using all of your hard-earned money. This comes in handy if you’re thinking of downsizing. At 1st Eagle Mortgage, we are experts on Reverse Mortgages. With decades of experience in the mortgage industry, we have the wealth of knowledge necessary to assist you through this process. *A HECM is a “Home Equity Conversion Mortgage” which uses the equity in your home to help you financially. In all cases, the right to remain in your home is contingent on complying with the loan terms, such as continuing to pay property taxes, homeowner’s insurance and costs associated with a mortgage. These materials are not from HUD or FHA, and were not approved by HUD or a government agency. Call 847.441.4116 to see if a Reverse Mortgage is right for you or click the Apply Now button below!